On June 17. 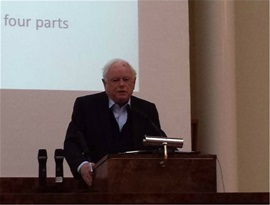 2014 Sir Anthony Kenny gave the first von Wright memorial lecture in the University of Helsinki. It was very welcome and interesting over all picture of the state of humanism today. Therefore it also opened the key problems of modern times humanitas. In the following are the key points (1.-6.) of Kenny’s lecture as given in his handout. After each of them I give my comments. Sir Anthony Kenny is known of his works on human action or free will and determinism, as well as on Aristotle, Descartes and Wittgenstein. He has made a contribution to Analytical Thomism presenting St Thomas Aquinas’s thought in modern terms. G. H. von Wright nominated him as trustee of the Wittgenstein Nachlass. Comment. Since Eino Kaila philosophy in the University of Helsinki had been dominated by analytical philosophy. However, in the early 1970’s G.H. von Wright opened a way for a complementaristic view of two traditions of philosophy or method of science. Kenny’s juxtaposition of humanism (Pico) and naturalism (Kepler) can be seen as the core of von Wright’s thinking after his Explanation and Understanding in 1971. In that book he studied basically same distinction of the two traditions of science in terms of galilean and aristotelian traditions. The aristotelian tradition of human sciences he specified in terms of practical reasoning and practical syllogism. Unfortunately there has been a tendency to reduce these basically humanistic concepts back to naturalistic tradition. As it is well known monistic or analytical tradition retrenched in much of the Western academic philosophy of science after Wittgenstein and von Wright - in Helsinki in the forms like critical realism or neuro-contextual reduction of human practice. This is why professor Kenny’s lecture is very welcome to open again the question concerning the fundamentals of human sciences and therefore also humanism and humanity – as well as von Wright’s tradition. 3. Many animals behave sufficiently like human beings for mental and emotional predicates to be applied to them without metaphor. But the anthropomorphic fallacy is committed if we attribute to them the possession of concepts that can only be manifested by language-users. The fallacy has practical consequences when animals are treated as members of the same moral community as humans. Comment to 2, 3 and 4. Here von Wright’s student finds it easy to agree with Kenny. The core of today’s hegemonic naturalistic culture is to see animals as humans and humans as animals or machines. Its roots go back to the monistic philosophies of science accepting only causalistic-empirical method as acceptable foundation of research and whole culture. This is exactly what Wittgenstein and von Wright saw dangerous for humans, ecosystems and whole social life of modern time. “5. Anthropomorphism can operate not only in the sub-human sphere, but also in the superhuman sphere. Predicates appropriate only to individual humans may be applied to social and political institutions. This may be harmless, but it may generate inappropriate emotional responses. In its extreme, Hegelian, form, institutional anthropomorphism leads to fascism. Comment to 5. and 6. Here is the basic dilemma of today’s humanism. Monistic causalistic-empirical approach does not give solid basis for self- understanding or understanding of humans or their social and cultural life. Informed, ethical and free humans are not keplerian or galileian, but they are relatively recent phenomena in history and they did not become from thin air. However, after having correctly criticized the monistic or naturalistic approaches on humanitas, not very much is left for understanding it with Kenny’s not too well founded remarks on “superhuman sphere” or Hegel indicating the possible roles of polis or civilization in becoming human or in its Bildung. That is why I put the following question and got the following answer. Kenny. I think that human beings are already free. That once rational, however did it happened, once you have all rational human beings, then there were various possibilities open to them. Comment. In what sense “human beings” or all human beings are already free. Obviously, taken empirically not all of them are free. Or are they free in the “Sapere aude” sense of Immanuel Kant, just in need to liberate themselves from internal chains – or in Rousseau’s sense in need to liberate them from the external chains. In any case, if all human beings are already free, why is it - as Kenny says - that when you get rid of few bad guys in a tyrannical country a Jeffersonian democracy will not bloom without any difficulty? Does Kenny indicate, that being free means being rational? If yes, what does he mean by being rational? Does he mean rationality in the sense of using reason and verified data alone in action. Or does he mean practical rationality in Aristotelian or von Wrightian sense of integrating reason and emotions in the first premise ie. goal of practical syllogism - as well as possible verified data in the second premise ie. in means towards the goal? Whichever the case, is it a secondary issue (“however did it happened”) how all humans or so some of them have become free practically rational actors - given that there is a natural history before becoming homo sapiens sapiens (some 10 000 years ago) and after that a cultural history of becoming free practically rational actor at some stage? Is it not important to understand this becoming in order to understand regression like fascism in moving humans backwards from the earlier becoming? Kenny. And one of the ways in which human beings have the advantage over animals is the way which information, qualified by one generation of human beings can be passed on to other human beings. That institutions that human beings get together and human beings build the institutions, and they can also learn from success and failure of these institutions in bringing about human wellbeing and happiness. History is an ongoing long lasting experimentation in the forms of society and life which best conduce to human welfare. Comment. This reminds of Jürgen Habermas’ historical materialism or Robert N. Bellah’s and naturalism in understanding the earliest and later phases of human history. But this also raises the question, is human mind or psyche by nature a kind of readymade information processing system storing the information from experience – and hereby leading humans to better forms of life. Or is there in the history of human psyche something special not captured by this kind of readymade system and its accumulating information – and its possible regression. The history from Antiquity and Rome to modern times seems to speak for the latter case. If we do not follow Edward Gibbon’s prejudice but the actual history it turns out that in the Roman imperial time there were two major schools competing to create a culture educating humanitas towards sustainably informed, ethical and free practical reasoning - finally leading to modern democracy. Those major options were Classic Platonic-rationalistic and Christian Pauline-Augustinian projects of forming the human psyche to full humanitas. An as it is well known, the Christian project took over and made the Classic to become its servant and ally – as well as die Bildung through human discourse in human polis . It is true that Wittgenstein said in Tractatuks (6.54), that “He must, so to speak, throw away the ladderafter he has climbed up it.” But I doubt whether this was Wittgenstein’s or von Wright’s final word. On the contrary it seems that in Wittgenstein’s later Philosophical Investications and other papers he seems to rediscover the ladders of the founding cultures – or Bildung. This is important because humanitas cannot survive in the thin air of monistic naturalism deconstructing human psyche and thereby pushing humans to believe that they are animals or machines and animals or machines are them. Comment. Kenny’s final remark of Jeffersonian democracy not blooming after few bad guys have gone seems to be perfectly correct in the light of recent history, say in Afganistan or in Iraq. Therefore it also underlines his or Kant’s or Rousseau’s mistake to say that humans are as by nature readymade free humans. The human history of becoming free is as long as human history itself, and in a way every generation is bound to repeat it – and therefore to progress or to regress in Bildung. 7. Pico della Mirandola’s oration found an eighteenth century echo in Alexander Pope’s Essay on Man. Mankind is there described as “the glory, jest, and riddle of the world”. Each appellation remains apt to this day. Comment. Here I agree with Kenny, Pico and Pope.